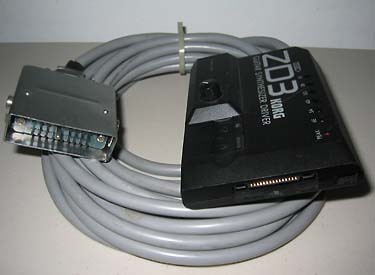 All Roland and Roland-compatible cables fall into two basic categories: either the early version 1 cables, with a latching-type mechanism, or the later version 2 cables with a pin-type mechanism. Since all these cables share the exact same pin configuration, they are electronically completely interchangeable. There is no difference between the wiring of a GR-500 cable and a GR-700 cable. Electronically, they are all identical. 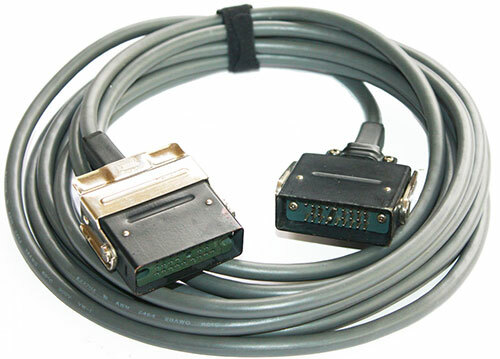 However, the later pin-type cables are slightly more universal, and provide a more secure physical connection when used with pin-type connectors. 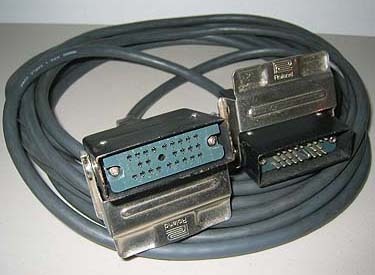 The pin-type cables also work well with latching-type connectors. Please watch the video, and see the chart at the bottom of the page for a list of devices and their connectors. Also, Mogami wire is used universally in all the cables. Please note the Korg Z3, because of its recessed design, must use the later, pin-type cables. Look to the repairs page for more information on maintaining and repairing cables. 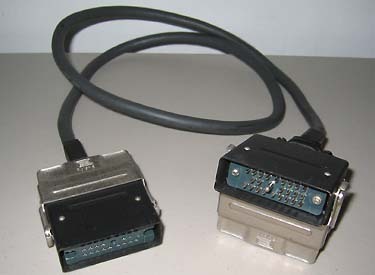 The proprietary Roland connectors were made by the Japanese connector company, Tajimi. 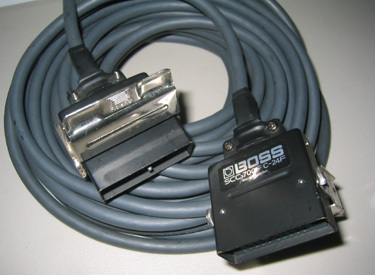 Pros: This is the cable that shipped with the original Roland GR-500, the first synth with the 24-pin cables. 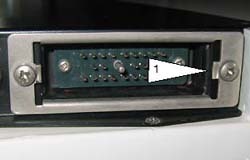 The first GR-500s and GS-500s used the pin-type latch, and subsequent models switched over to the locking ring mechanism. 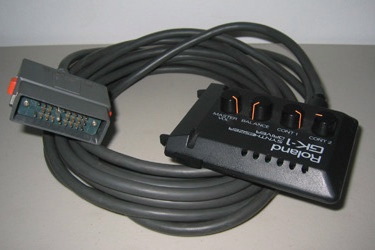 Pros: Widely available, the most common Roland guitar synth cable found. The metal shell is easy to open, and easy to repair. These cables should last forever. Cons: Chrome latches are prone to corrosion. When used with later equipment, GM-70, Ibanez IMG2010, etc. these cables are not as secure as version 2 (pin-type) cables. Pros: These cables are great for use with the Roland US-2 where the shorter length is preferred. Also easy to repair (see above). Pros: After the original cable, these are the easiest cables to find. Because of the all-plastic construction, these cables are not prone to corrosion. These cables universally work with all Roland, Ibanez and Korg gear. Cons: Practically impossible to repair. According to GR user David Paviol these cables are internally potted and glued, and cannot be opened without destroying the shell. Pros: In many ways, I would have to say this is the rarest cable I have come across. 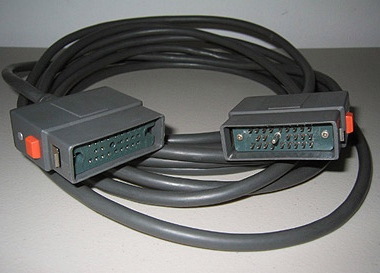 I am guessing that these cables are from the end of the original 24-pin series. Like Big Foot, these are impossible to find. In all my years, I have seen one of these, and this is it. Cons: Practically impossible to repair. Pros: The Roland SCC-700F/C-24F Version 1 was originally designed for the Boss SCC-700 Sound Controller Center, a programmable effects switching/routing system. This cable is 8’ longer than the standard cables, and is also thicker than the standard cable. Cons: Very, very hard to find. 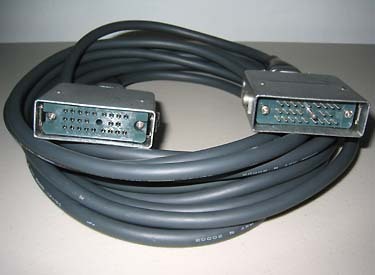 Pros: A longer version of the original C24-B, this cable is 8’ longer than the standard cables, has rugged metal shells, and is easy to repair. This cable works universally well with all vintage 24-pin guitar synths or the SCC-700 Sound Controller Center. This cable is also thicker than the standard cable. If you need a very long cable, this will do the job, but a bulky, 24 pin cable that is 24' long can be somewhat unwieldy. 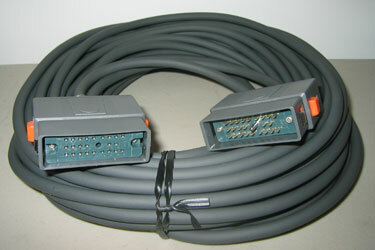 Pros: This cable is similar to the Roland C-24B and C-24F cables, 16’ long. The cable is almost identical to the later C-24G Roland cables, but with textured aluminum metal shells instead of plastic. This cable is a great alternative to the Roland C-24D cables. With the pin mechanism, they work well with the early Roland synths, GR-100, 300, etc. as well as the GM-70 and G-77B, which do not have a locking ring mechanism. Cons: Definitely hard to find. These were probably only distributed with the Ibanez IMG-2010 and MC-1 system. Pros: Included here for comparison. These cables work only with the GK-1. They use the exact same plastic connector as the later Roland C-24D cables. Cons: Works only with the GK-1. Plastic shell connector seems impossible to open to repair. Pros: Included here for comparison. These cables work only with the Korg Z3. They use the exact same metal connector as the Ibanez cables, with rust-resistant shells. The wire used bears the name "Tonichi" instead of Mogami. Cons: Works only with the Korg ZD3 driver. 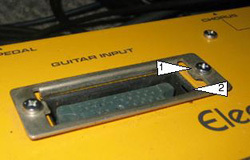 The original, older style Roland connectors used a metal latch to connect to a locking frame on the guitar synth. This is illustrated above at Point 1. 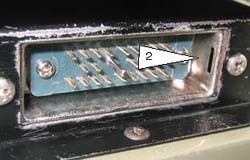 The second generation Roland C-24D cable uses metal pins that extend inside the guitar synth connector to hold the cable in place. This is illustrated above at Point 2. 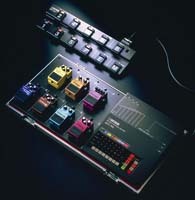 This change is detailed in this document from Roland Corporation issued during the GR-500 production run. Click HERE. 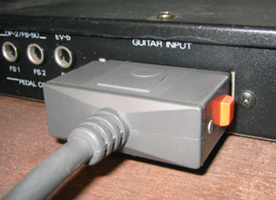 Only the pin-style cables will connect to the recessed front panel connector on the Korg Z3 guitar synth. The metal latching connectors will not fit. 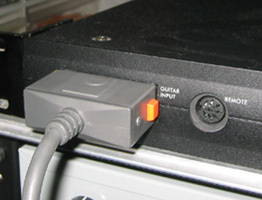 The pin-style cable connector (with the same type of end as found on the GK-1 system) with the Roland GM-70. The Boss SCC-700 Sound Controller Center uses the 24-pin cable for its remote footswitch.